This is a small to medium-sized deciduous tree in the cashew family (Anacardiaceae), which is native to central and western China. Leaves are alternate, pinnate, with 10 or 12 leaflets. The tree is dioecious, with male and female flowers growing on separate plants. Flowers are in panicles at the ends of long branches. The fruit is a small, red drupe, which turns blue when ripe and contains a single seed. It is a hardy tree that can withstand harsh conditions and poor soil quality. 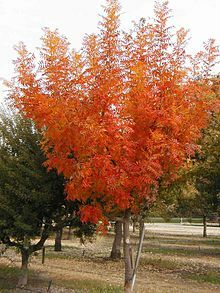 Although native to hill and mountain forests on rocky soil, it is often utilized in urban environments as a street tree due to its hardiness, impressive fall colors, and attractive fruit. It is, however, shade intolerant and grows best in full sun. Thriving in warm climates, Chinese Pistache is found as far south as Florida, and in the low-elevation deserts of Arizona, it is the only plant whose foliage turns red in the fall. In China, the oil from the seeds is used in biodiesel production.